The motor, sensory and sundry other tracts, the spinal grey matter, and the spinal nerve roots should no longer be strangers to you. The terms and symptoms that will be discussed are used daily by clinical neurologists. Clinicians often think in terms of "syndromes." A syndrome is a pattern of symptoms (what the patient complains about) and signs (what the physician finds) which suggest the location of a disease process and occasionally its nature. The consequence of nerve root damage (from any cause) is known as a radiculopathy (L. radicula = little root; pathos = disease), whereas the syndrome of "myelopathy"(Gr. myelos = marrow, pertaining to the spinal cord, pathos = disease) results from spinal cord damage. Since it is impossible to discuss all types of nerve root and spinal cord disorders in the time available, we have chosen to focus on the clinical features of syndromes caused by compression by tumors or other lesions affecting the nerve roots and the spinal cord. Compression of nerve roots or the meninges covering the spinal cord usually presents with back or neck pain. Back pain is a very common symptom and results in costs up to $50 billion annually for medical care and disability payments. Back or neck pain may be caused by a variety of musculoskeletal mechanisms and the physician needs to be able to examine the nervous system to determine if there is compression of nerve roots or the spinal cord. The anatomy you are learning is essential for understanding exam findings and symptoms of root or spinal cord compression. The peripheral nervous system begins at the nerve roots. Each segment of the spinal cord gives rise to a ventral or anterior motor and a dorsal or posterior sensory nerve root. 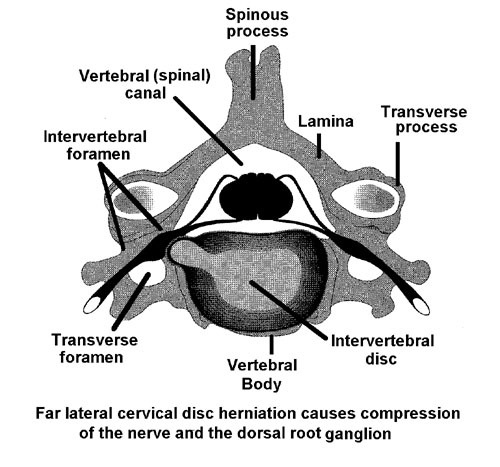 The spinal nerve roots can be damaged as they traverse the spinal (vertebral) canal, but are especially vulnerable in the intervertebral foramina, where the ventral and dorsal spinal roots join to form the spinal nerves. Look over the segmental innervation of the lower and upper limbs in the following charts. This should be familiar from your recent Gross Anatomy course and will help you understand some of the following material. Most muscles are innervated by more than one nerve root and the lesion of a single nerve root does not produce well-defined sensory loss because of overlapping of the branches of dorsal root terminals from different segments. Besides strength and sensory testing, the muscle stretch reflexes are evaluated by briskly striking the tendon of a muscle and eliciting a contraction, e.g. the knee jerk. - فقه الطهارة - الحيض - النفاس - الاستحاضة.